Note: *Sleeping capacities do not mean like number of adults or full size teenagers can be accommodated comfortably. 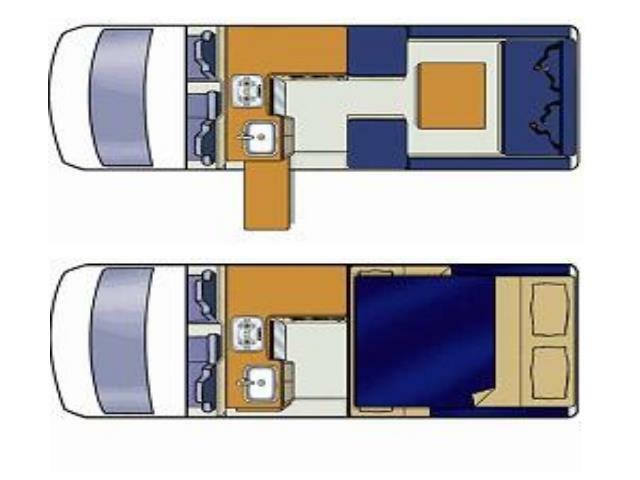 The features, bed sizes, and amenities listed are representative and may be changed, added or deleted without notice. The numerical vehicle lengths are approximate. Specific floor plans or models will vary and cannot be reserved or guaranteed. Driver's cab air-conditioning operates only when the engine is running. Child Seats : 2 anchor points in back row = 2 baby seats (forward or rearward facing) in back row. No anchor point in the front of the vehicle. *Note: children that require restraints cannot be seated on the side-facing seats in rear. Baby/Booster seats must be pre-booked, otherwise cannot be guaranteed. Please advise age and weight of child on booking. Can Opener, Carving Fork, Egg Lifter, Ladle, Cutting Board, Tongs, Forks, Knives, Spoons, Tea Spoons, Cereal Bowls, Cups, Glasses, Side Plates, Dinner plates, Micro Dishes, Saucepans, Frying Pan, Kettle, clothes hangers. Entertainment : AM/FM radio and CD Player. Storage : Storage area under benches. Recommend soft luggage. 12-13L per 100 km. This may vary subject to the use of air-conditioning, temperature and terrain. 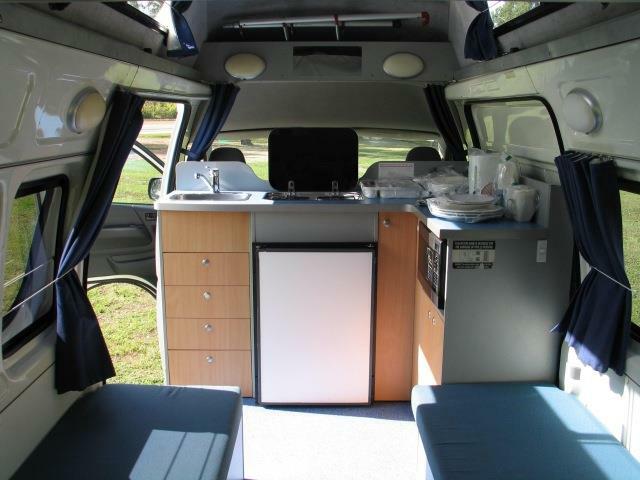 To operate 240V power sockets, the van must be connected to 240V power supply. 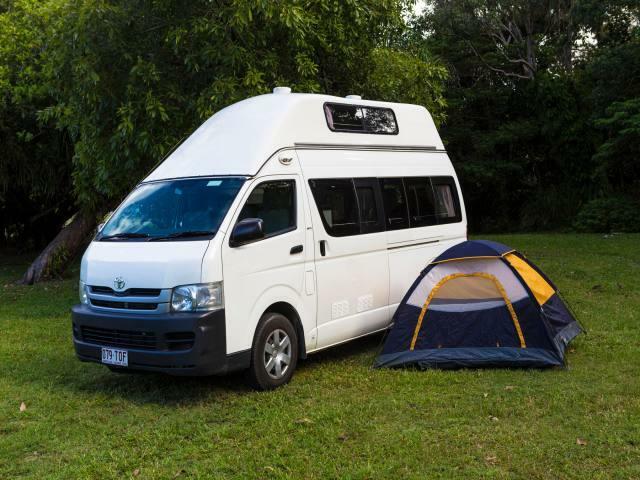 This vehicle is supplied with a 10-15m mains power cable for use at the campgrounds. Cigarette lighter is suitable for recharging camera and phone batteries. 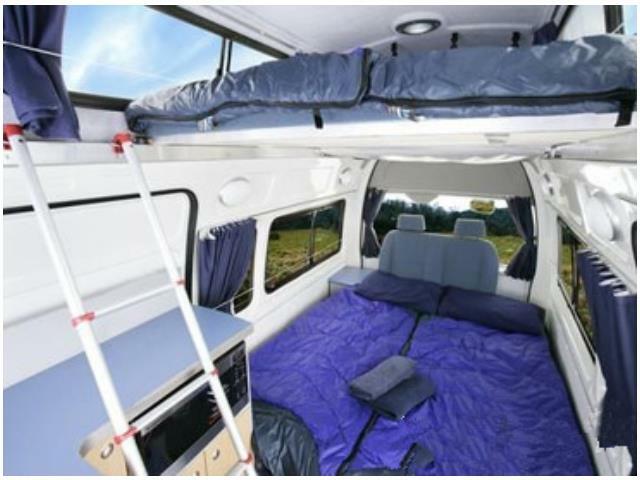 Personal Kit (included in vehicle): Towels, Sheets, Sleeping bags, Pillows, Tea towels, Linen . 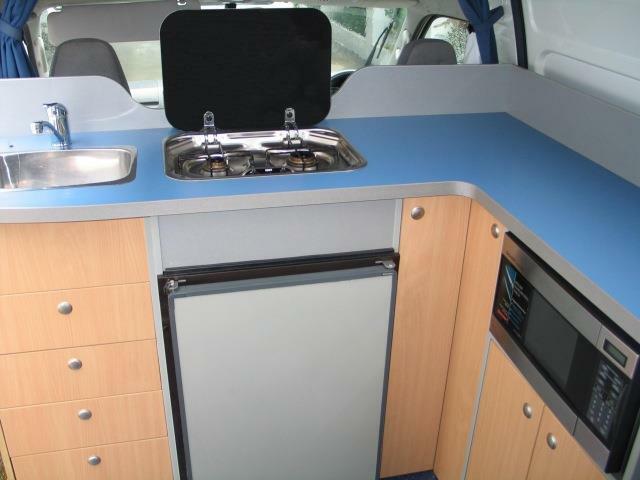 The campervan power will last up to 24 hours, when fully charged. 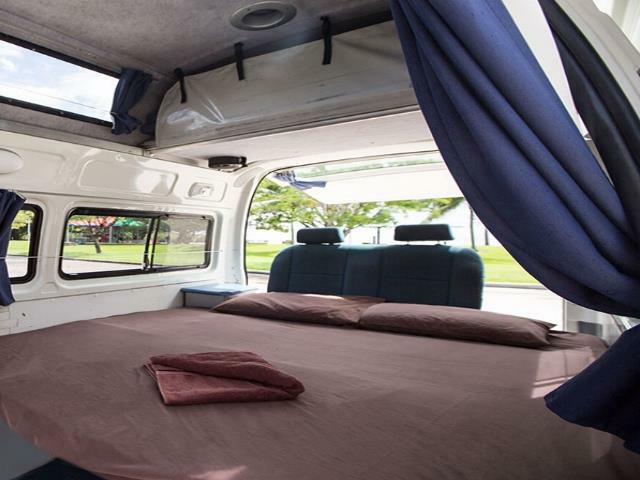 Campervans are recommended to stay at powered sites every evening unless the campervan is driven continuous for 7 hours per day which will charge the battery enough to be with sufficient power for 24 hours without 240v power. 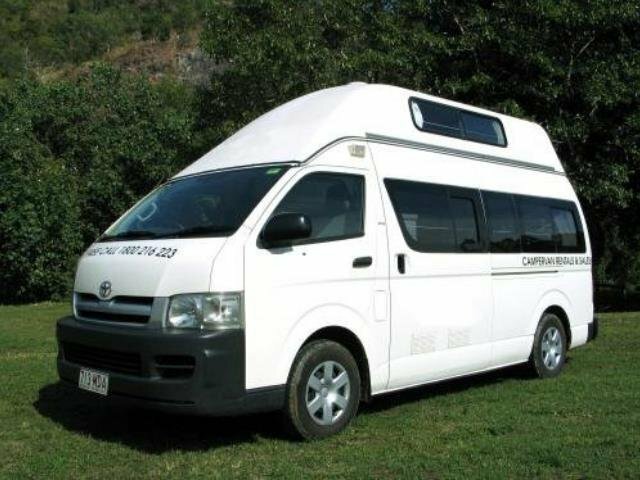 Please note:These pictures and specifications are indicative of the vehicle that will be supplied under your booking. 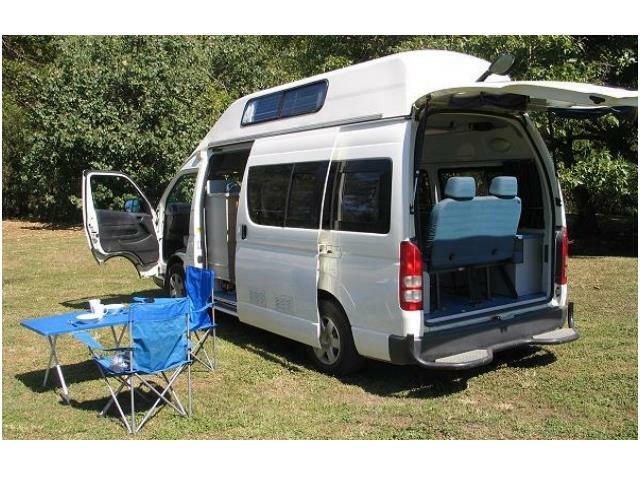 Actual vehicles may vary according to year of manufacture and availability but your vehicle will be suitable for the required number of people and have similar specifications to those on this website. Specific specifications cannot be requested. All measurements are approximate, not guaranteed and specifications may change at any time without any prior notice.